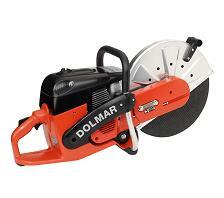 Efficent and effective, DOLMAR power cutters cut through the toughest materials while saving on time, energy and money. Considered among the best on the market by experts in fields such as masonry construction,building contractors,steel construction and agriculture usage. Features include handle positioning to easily carry, Mounting of cutting arm possible either in the center or the side of machine. Compression release reduces pulll-rope resistance by up to 70 %. A three-layer foam air filter with paper filter ensures clean air intake. Metal clipstraps securely holds cover in place and removes in seconds giving you easy access to the air filter and spark plug.